A huger percent of Internet users having BSNL Broadband connection accept that compare to private telecom service providers BSNL broadband services is the best with high speed and access. India’s most trusted telecom brand Bharat Sanchar Nigam Limited (BSNL) has introduced new Unlimited Broadband plan under Broadband services in Bhopal and Indore SSA of Madhyapradesh telecom circle on promotional basis for limited period of 90 days. For this plan customers have to Six months rental charges of Rs.4245/- in advance instead of monthly rental charges. Under ‘BBG Combo ULD 4245 CS29’ plan monthly bandwidth (download speed) is 4Mbps till 10GB (Free data usage) and beyond free usage speed will be 512kbps. Free e-mail IDs/space (per e-mail ID) is 1/5Mb and 500 Free calls per month (within BSNL N/W, Local plus STD). After consumption of Free calls Customer will be charged Rs.1 MCU charges for BSNL network and Rs.1.2 MCU charges for other network. 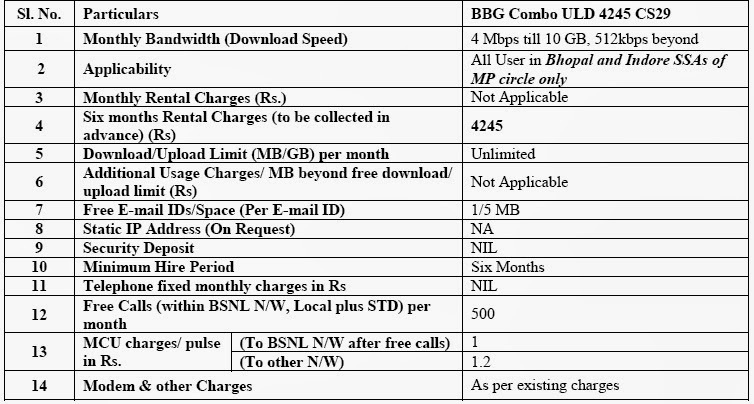 Promotional offer BBG Combo ULD 4245 CS29 Unlimited Broadband plan will be applicable to all users in Bhopal and Indore districts of Madhyapradesh telecom circle for limited period of 90 days by following terms and conditions. The above offer will be implemented and with effect from 01-07-2014. Videocon Telecom invests approx Rs 130 Cr to upgrade its network to 2.75G EDGE,a 3G standard technology, to enhance Customer experience on data speed.Rolls out a full-fledged marketing campaign to get Customer attention.